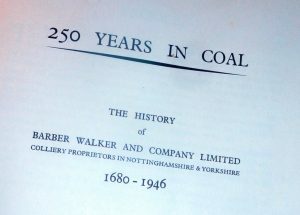 Whitelock in his definitive history of the Barber Walker Company (250 Years in Coal – 1956), quoted from a local Nottingham newspaper on the events which occurred at Harworth Colliery immediately following the outbreak of war. Whitelocks definitive history of the Barber Walker Company published in 1956. Notts Village raided. Sixteen German Colliery Reservists arrested and imprisoned. Both in the city and county yesterday, quite a number of German subjects were made prisoners of war. Perhaps the most important capture was made in the course of a raid, upon instructions of the War Office, by the Police and Military on the north Nott’s village of Harworth. At the present time a new mine, financed by a German English syndicate, is being sunk in the neighbourhood, and quite recently a number of German workmen came to England on order to sink the shaft in a manner peculiar to the Westphalian Coalfield. 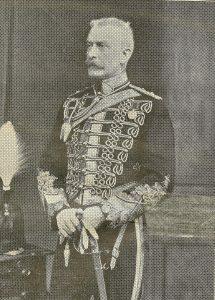 Col. A. E. Whitaker, Sherwood Rangers, who assisted in the arrest of the German sinkers at Harworth Colliery on 7th August 1914. This information has subsequently been repeated, without being added to, in several other publications and documents , both by local historians and academics. (See Bibliography: WEA—Bircotes Branch 1974; Murphy C, 1974; Waller, RJ—1983 and Robson, C—1984). A welcome deviation from this was provided by Robert Ilett of Worksop in an article entitled Beastly to the Germans: Germanophobia in the Worksop area in the Great War, published in the Nottinghamshire Historian, No. 96, Spring / Summer 2016, p. 21—25. In the article he mentioned the fact that the workforce was not entirely German, despite rumours to the contrary and did employ some local men. He also mention the influence of Muriel Gough, daughter of the Headmaster of the Retford Grammar School, who was fluent in German and acted as interpreter in the discussions with the interned German members of the sinking team. 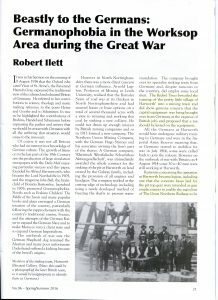 Robert Ilett’s article on Germanophobia around Worksop Area during the Great War which appeared in the Nottinghamshire Historian No. 96 – Spring / Summer 2016. Jim Dymond, a historical researcher from Kimberley, looked further into the events at the Harworth Colliery site in the immediate aftermath following the outbreak of war. By studying weekly accounts in the Colliery Guardian (CG) from August to November 1914, under the section, Notes from the Coalfields (Yorkshire), he managed to get a more detailed account of the situation in the developing Doncaster coalfield on the outbreak of war. This added significantly to the previous accounts which had repeated much of Whitelock’s account of the incident in 250 Years in Coal. 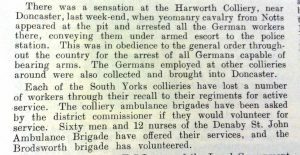 Report from the Colliery Guardian, dated 14th August 1914, on the arrest of German and Austrian sinkers at Harworth Colliery. 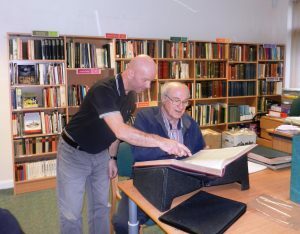 David Amos (left), Coordinator of the Harworth Colliery WW1, with project researcher Jim Dymond (right) at the library of the National Coalmining Museum for England at Caphouse Colliery, near Wakefield – December 2016.